Kitchens can also feel really cluttered when we're spending so much time with holiday baking, entertaining, and preparing holiday meals. 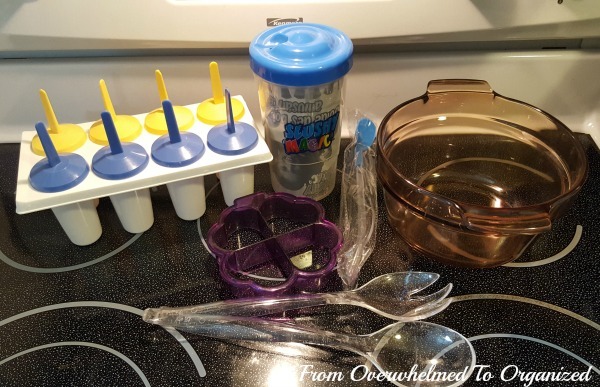 This week I'm sharing tips for decluttering your kitchen. 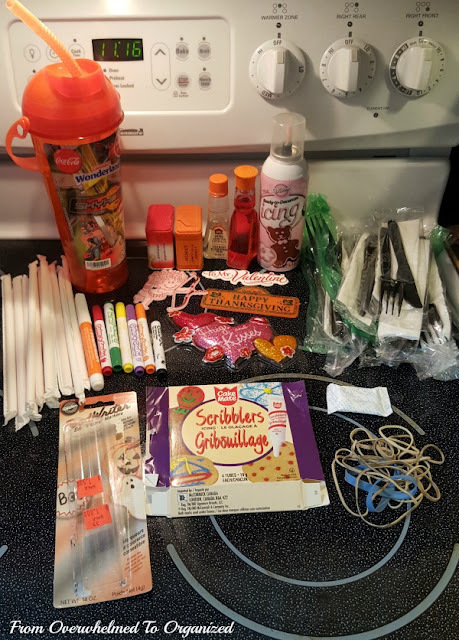 First I tackled my baking ingredients and party supplies. I found a bunch of stuff to toss! After that cabinet I got on a roll and I ended up going through all my main kitchen cabinets and drawers. And I found 1 bottle of old prescription meds that I brought to the drugstore. I still need to do a little more decluttering in our pantry cupboard, fridge, and freezer, but overall I'm really happy with everything I was able to get out of our kitchen this week! 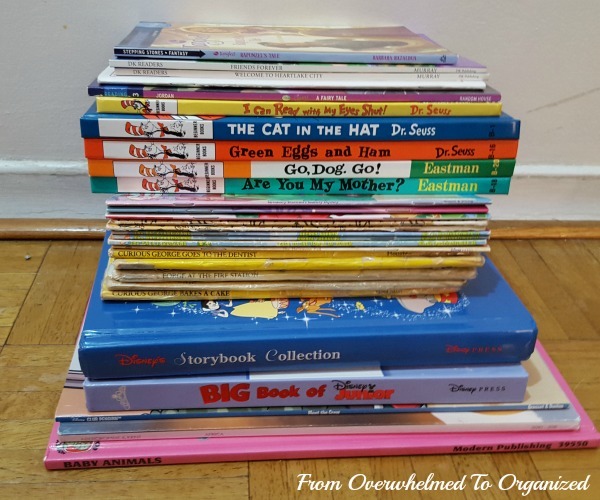 I know kids' week was last week, but it was a busy week for my kids, so we did a bit more decluttering this week. 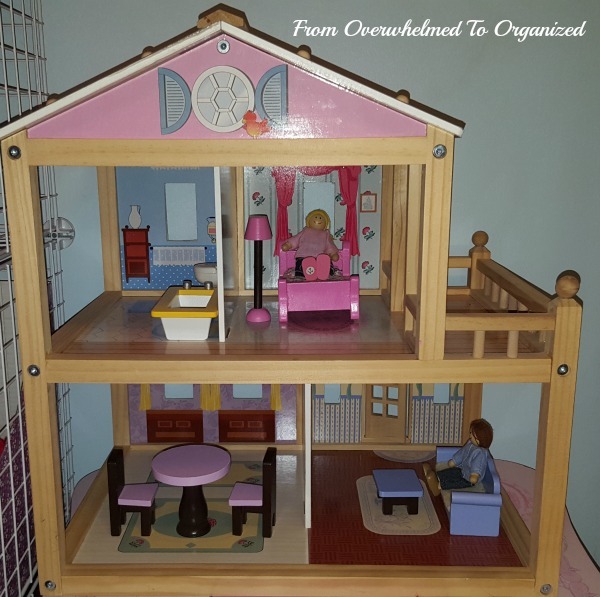 She loved this dollhouse when she was younger but hasn't played with it as much the last couple of years. When we rearranged her room this summer we put it on her little table, hoping that having it up off the floor would encourage her to play with it more. But she still didn't really play with it and she missed having the space on her table to do crafts and activities. This summer she met a lot of my extended family at my parents' 50th wedding anniversary and had fun sorting out the difference between 2nd cousins, 3rd cousins, and cousins once removed, twice removed, etc. Anyway, my mom has been giving a few kids' toys to my 2nd cousin for her granddaughters to play with and we're hoping to give the dollhouse to them as well. I think that makes the little girls 3rd cousins once removed to my daughter. So fun! My daughter also enjoys passing down toys and books to her younger cousin and she's giving away 28 books. We're also recycling 1 box that a set of books came in since the books are being split up and won't likely be re-united later. I'm doing really well at not letting things enter our home so far this month. Most days have been zero! This week we got the kids' school photos and most of them will be given away but I'll count the 2 large ones that go in frames in our living room and the 4 wallet pictures that my hubby and I will keep in our wallets (1 of each of our kids). We also went indoor mini-golfing this weekend and my son wanted to keep the scorecard in his memory box. Take some time this week to declutter your kitchen. 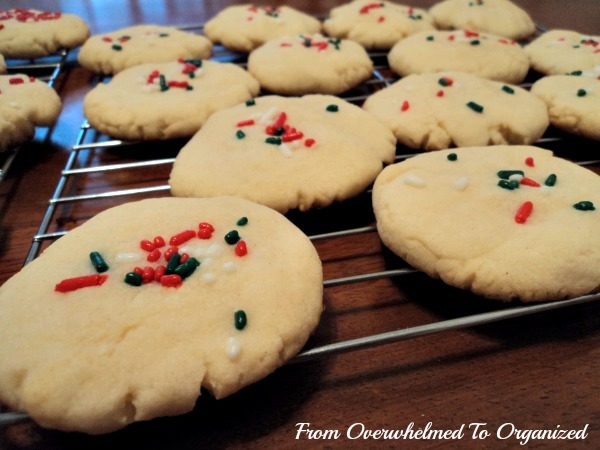 It will make your holiday baking, entertaining, and even just day-to-day meal prep on those busy December days a lot less overwhelming! Don't forget you can declutter anything you'd like though. If you've got a more pressing need, go for it! 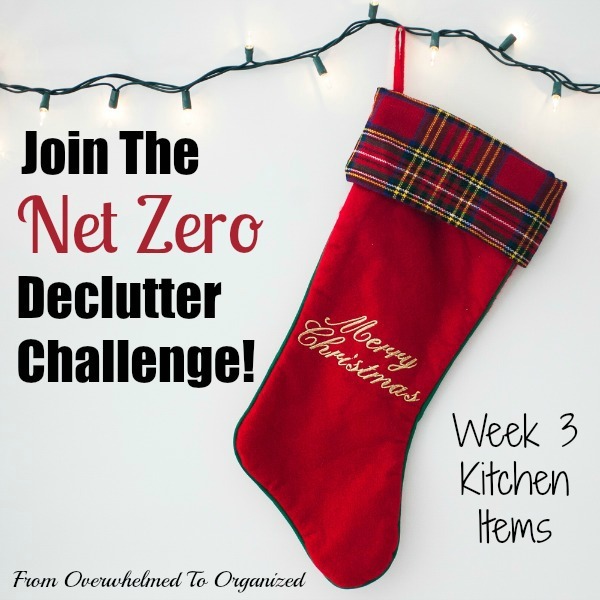 How much did you declutter from your kitchen this week? How many kids' items did you declutter last week? How are your overall in / out numbers? 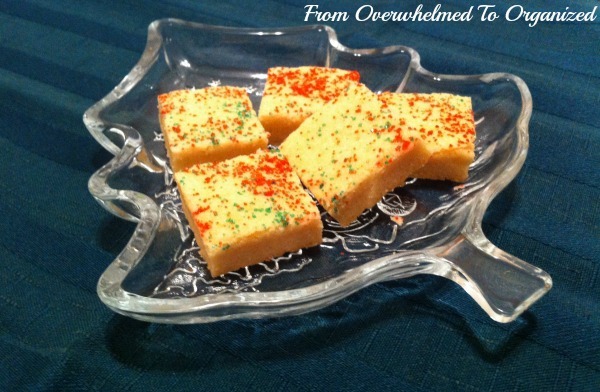 That's an impressive list of items that you discovered you could let go of in your kitchen! It makes me wonder what's lurking in MY kitchen drawers and cabinets. I do go through periodically to declutter and reduce the amount of items that have collected, but you've inspired me to do this again soon. Thanks Linda! It's amazing how stuff just builds up and what we can find if we look. Hope you find lots of things to declutter! Thanks Sabrina! January is a great time to declutter too...especially since December is so busy. I love that lighter feeling when stuff leaves my home! I love working on a kitchen because there are fewer items that we have a sentimental attachment to, and so many of the items have the expiration date. Plus, it is a room you use all day long, so the rewards pay off in a big way! That's a really good point Seana! It's hard to argue with expiry dates (although I've had some clients that do), and decluttering and organizing it can make such a huge difference in the day-to-day stuff we have to do there. Good for you for getting rid of so much stuff. I love how you inspired your daughter to do the same. Kids learn from watching their parents. 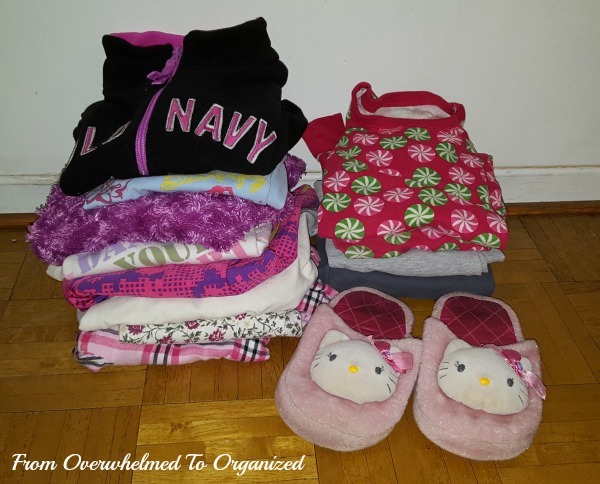 Organizing and decluttering is a great lesson for children to learn. Well done!